The Subaru WRX STI has been in America for around 15 years and it’s still one of the most attractive affordable sports cars available, even though its base formula has barely changed. But how long can Subaru keep that up for? It’s not like the Japanese automaker is incapable of improvement, though the average driver might not get a sense of that by driving each generation of WRX STI back-to-back. The WRX STI is a great car—I should know, I daily drive one. It doesn’t necessarily need massive power bumps or drastic powertrain changes. But it is just nice when things change, or get noticeably better, and the new special edition WRX STI S209 is a reminder that Subaru and Subaru Tecnica International, its in-house performance division, are indeed still capable of improving something that’s already good. The S209 is a special edition S-line WRX STI, the first S-line car to make it to America with more power, more grip, and a bigger price tag. STI will only be building 250 of these, but every single one of them is earmarked for the U.S. market. Like the STI Type RA, it’s exclusive and track-focused, but its performance has been taken a step further by Subaru’s performance division. We first saw the S209 when it was unveiled at the Detroit Auto Show in January. 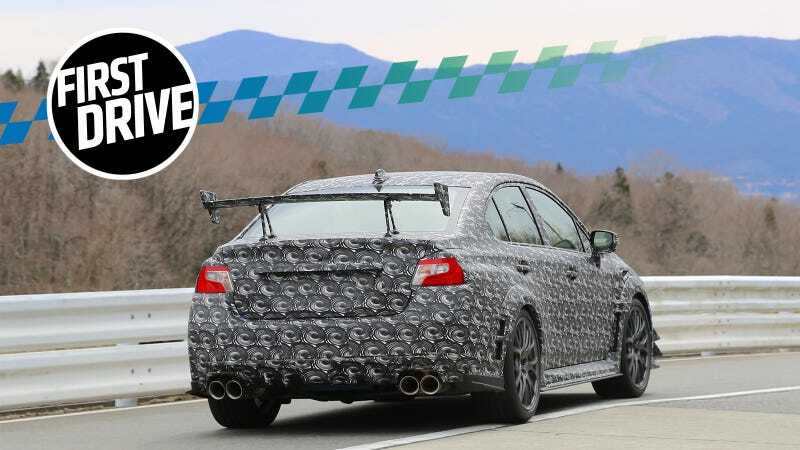 From the outside, it pretty much looks like a beefed-up base STI, and that’s because that’s exactly what it is. The S209 still has the same standard formula that you’ll find in any U.S. STI—a turbocharged, four-cylinder, boxer engine mated to Subaru’s all-wheel-drive system with a center diff that the driver can electronically control—but now, it puts out 341 horsepower instead of 310, has new specially-designed, ultra-grippy performance tires and reworked suspension to complement those shoes. The S209 is also a big deal for Subaru and STI. This is the first car the performance division is officially the manufacturer of that it’s bringing to America, its largest market in the world. It’s even such a big deal that Subaru nearly marketed this model as a tribute to the 22B, the most iconic car the automaker ever produced. So, yeah. Subaru thinks it’s important. But how does it actually drive? Well, dear reader, let’s get into that. The most in-your-face change—aesthetics aside—between the S209 and the base STI is the extra 31 hp. In the three or so laps around a smaller side circuit at Fuji International Speedway, I could feel the new “thoroughly reworked,” as Subaru says, EJ25 and its new, harder-working HKS turbo doing its job as I powered out of corners and did third-gear pulls down the track’s straightaway. It’s power that I long for in my stock, 305-hp STI, and I’m sure it would’ve also been appreciated by those who chose the 350-hp Ford Focus RS over the base STI for its additional punch. Also, the S209 has a new “low-restriction exhaust,” according to Subaru. While it might reduce backpressure and help with performance in one way or another it just... isn’t loud enough. Come on, guys. This thing is just begging for more brap. Here. Listen for yourself. I decided the answer was yes. Slowing the car down as I approached the end of the straight, lap after lap, never felt like an issue. In fact, in my limited time in the car, I had trouble adjusting to just how powerful the S209’s Brembos and its high-performance pads were. Unlike what I’m used to when I drive my daily hard, I didn’t experience fade, and the car slowed and stopped when I asked it to. Without any backtalk! How polite. And then after braking–it corners! Oh boy, does it corner. The S209’s specially designed 265/35 Dunlop SP Sport Maxx GT600A summer tires grip, and grip, and grip. But it’s not just the rubber doing all the work here. There are also new Bilstein dampers, stiffer springs, STI’s flexible front strut bar, and a set of trick flexible draw stiffeners in the front and rear. Together, with the car’s active torque vectoring system, it all works. That means, finding understeer, at least at the medium track speeds I was pushing the S209 at, was not easy. Also, according to Subaru, this thing can pull more than 1.0 g of lateral grip in corners. Honestly, I believe it. That’s me...holding the phone in the passenger seat. Unfortunately, I can’t truly speak on how terrible of a road car all of these suspension upgrades make (or maybe don’t make!) the S209. My seat time in the car was limited to driving a single pre-production test mule on a small track for just a handful of laps. In that setting, the S209 felt perfectly where it belonged. The thing I just can’t shake, though, is why does all of this increased performance need to be hidden in a car that only 250 people will get the chance to buy, at a price that’s probably completely unreasonable? We don’t yet know how much the S209 will be, but it will definitely cost more than the $50,000 Type RA. Oh, and add whatever additional dealer markup on there, I would not be surprised if these were going for more than $65,000. The S209 is a good car. And if you’re the right kind of enthusiast, it’s a very special car. But why can’t the things that make it such a quality performance car make their way into something that normal STI buyers could afford? As we previously reported, STI claims there are too many things that get in the way of mass-producing cars like the S209. That’s why production, which is limited to around just two cars a day, is completed by STI at Subaru’s Kiryu-Kougo subsidiary. But is it truly impossible for Subaru to figure out how to add wider tires, a higher-output motor, and some more intense suspension bits on at the main production facility? It’s not like STI buyers would shy away from a higher-performing STI. That’s why the WRX exists. The Mitsubishi Lancer Evo might be gone, but the base STI still needs to be able to hold its ground against competition like the Focus RS, Honda Civic Type R, Hyundai Veloster N, VW Golf R, and others coming in and out of the market. If it continues on as virtually the same car it’s been for 15 years, I don’t have faith that even STI loyalists, like myself, will continue to buy the worse-performing car just because they like the exhaust rumble and its cherry blossom red emblem. The S209 is proof that Subaru and STI are capable of pushing the boundaries of what cars in this segment are capable of. Now they just have to figure out how to build more than two a day and make it affordable.